Several months ago I bumped into a fellow PVQA member in the elevator while at Festival in Long Beach. She started telling me about a project that she and a group of friends were working on, inspired by my Dolls & Dresses to Appliqué. 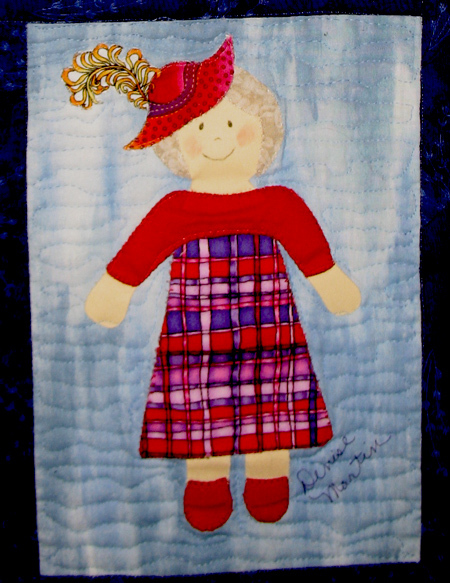 Each member of the group was making a self-portrait Red Hat doll! It wasn’t until the October PVQA meeting that I had a chance to see the completed quilt. So exciting!! It was red-hat-letter day for me, as there’s nothing better than seeing what others have done with your designs. How darling! I didn’t know a lot about the Red Hat Society, so I asked them to send me some information about it. 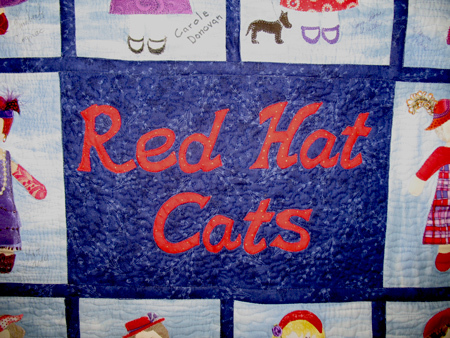 The Red Hat Cats, who created this self-portrait quilt from your book, is a local chapter of the Red Hat Society. Two of us purchased your book at the last PVQA show, and the members worked from the books together to create the blocks in the quilt. The Red Hat Society-Fun and Friendship After Fifty-is a “disorganization” of women. Sue Ellen Cooper, the founder and Exalted Queen Mother was inspired by the “When I am an Old Woman” poem written by Jenny Joseph. The very first Red Hat, given to a friend of hers who was turning 50, is now in the Smithsonian. We get together to have fun, and we are very good at it. Our chapter meets once a month to sew together, and we have monthly field trips (most recently to Half Moon Bay for lunch and pumpkin picking) and what are now traditional yearly events such as a Holiday Cookie Exchange, Summer Potluck and Croquet tournament, and a Winter Soup Potluck. We all belong to other organizations, but we tell ourselves often that this group is the one that we cherish most. There’s a huge span of ages from a Pink Hat (under 50) teacher in her thirties to women in their late seventies. Everyone is supportive, active, and FUN. I’m sure you can tell that from the blocks on the quilt. Thank you for inspiring us with your book. We loved making the quilt blocks, and Shary Lewis had fun assembling the quilt. 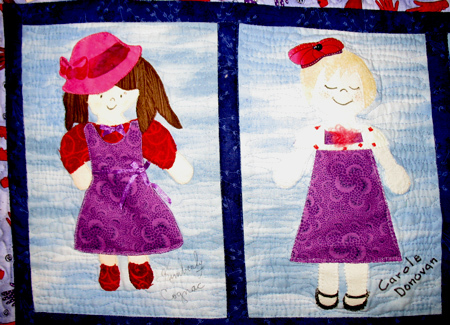 Carole Donovan quilted it at one of our sewing sessions, and we are super pleased with the result. 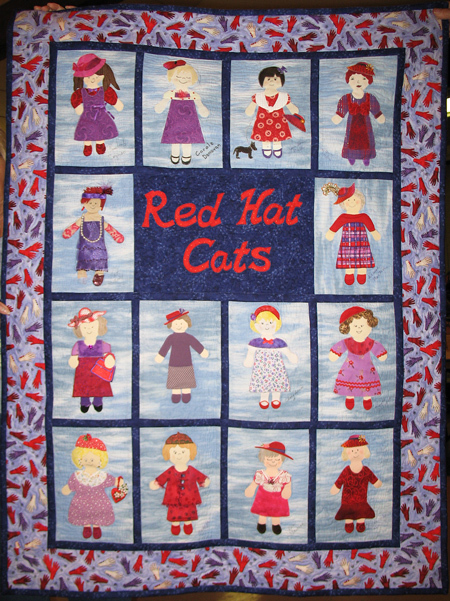 For more information about the Red Hat Society, contact their website at www.redhatsociety.com. Denise Martin, current Queen Mother of the Red Hat Cats of Los Gatos. It was great to learn more about the disorganization and about the Red Hat Cats :). Here are some closeups so you can see more of the personalization and detail that each member put on to portray themselves. This flapper lost a shoe in all the excitement, poor dear. I love all the little details, embellishments, and additions. They really took my patterns and soared! Not all of the members are quilters, but I heard that they enjoyed learning how to fuse from the ones who are. We enjoyed sharing our quilt with you at the meeting. We really had a great time creating our “dolls.” Several gals had never done any fusing and they thought this was great fun. 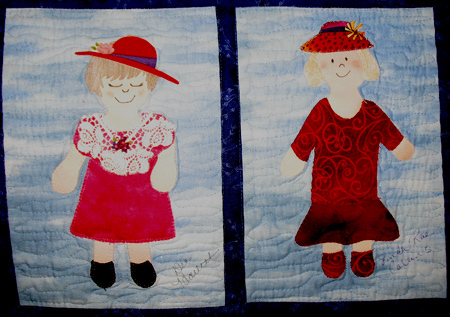 We hope to put it in the PVQA Quilt Show and also the SCVQA Quilt Show in 2011. We will take turns hosting the quilt for a month at a time in our homes. My whole family was able to pick out me immediately and it will be fun to hear if other families can do the same. Participants were: Denise Martin (Queen Mum), Jacquie Christensen, Linda Collins, Karen Cognac, Kimberly Cognac, Carole Donovan, Dee Hallett, Pat Havey, Jeanne Holmes, Shary Lewis, Anhela Oropeza, Joyce Schellenberg, Fay Taylor and Janeanne Walters. 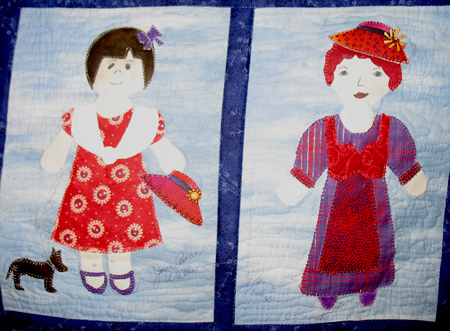 Thanks for a really fun pattern, I am hoping to do it with my granddaughter (she will be 8 in January). My pleasure, one and all!!! 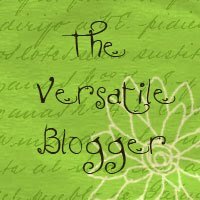 I recently received the Versatile Blogger award from a fellow blogger who enjoys my blog. How very cool! I certainly appreciate receiving an award of any type! What does it mean? I asked myself. I Googled the term and found Versatile Quilter awards all over the internet, and not just among quilting blogs. You name it, this award is going around it, and I couldn’t find out who started it. Not knowing its provenance, I’m choosing not to pass the award along, which would involve telling you seven things about myself and presenting the award to other blogs that I read. However, I will tell you about one blog that you may find of interest. Did you know that Checker Distributors publishes a blog? Called the Checker Newsletter, it’s mostly written by Penny Haren, author of the Pieced Appliqué series of books. Penny’s not a Checker employee but works with them a lot in the industry. The blog highlights all the brand-new things that are coming onto the market… very interesting! The fellow appliqué enthusiast who sent me the award is Erin Russek, who writes a pretty darn versatile and attractive blog herself. Thank you Erin! Erin’s blog is One Piece at a Time and she does lovely, lovely work. 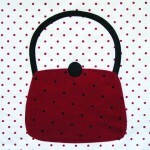 Not only that, she has posted several appliqué tutorials that you’ll find of interest. Well, I still don’t know who started the Versatile Blogger award, but the way I interpret it is that Erin finds my blog worthwhile, so I’ll take it and run! :) Thank you so much again Erin! Your original designs are gorgeous. Here’s Erin’s “Miss Kelly.” It’s the center block for her 2011 BOM called “My Tweets”. There will be a free small pattern every month so be sure to check it out on Erin’s blog. 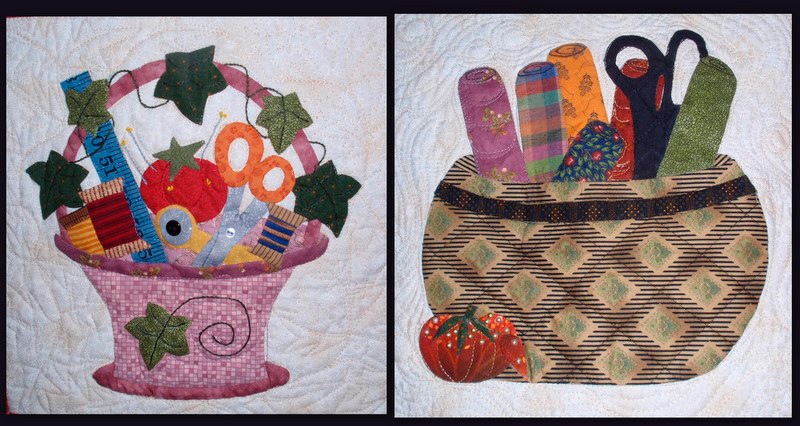 The Fall Into Fall Quilt Bloggers Giveaway is in full swing! If you haven’t checked it out yet, by all means do so. Winners will be drawn on October 15. Visit my giveaway here. Now to today’s topic. I recently received the most amazing message from Rebecca Hoffmann of Plant City, Florida. It made my day and then some!! 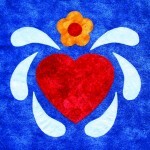 I am a member of Feather Princess Appliqué Guild of Tampa, Florida. 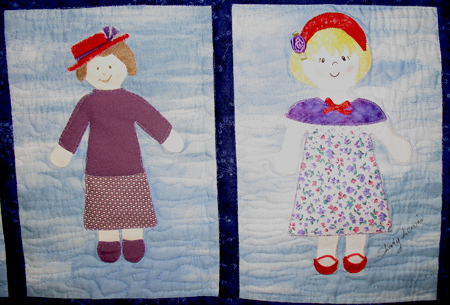 One of the sewing circles of the guild is “Sewrority Sisters Appliqué Sewciety.” We meet once a month for four hours of sewing and fun at one of the local libraries. 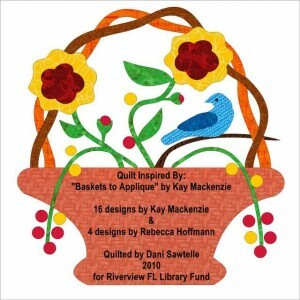 We wanted to give something to the library for allowing us to use one of their rooms, so we decided to make a raffle quilt and donate all the proceeds to the Riverview Library. I contacted you last year about using your basket patterns for a raffle quilt, and you gave us permission. My group has finally finished the quilt and I’m sending a photo of it. Is this not a masterpiece of a quilt? I am totally blown away. This is a group of gals who are not afraid of appliqué! They enlarged the blocks, designed a new setting, and embellished many of the blocks in a most delightful fashion, I love it! 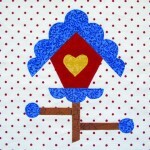 Each person donated $10 towards the cost of fabric, batting, etc., for the quilt. 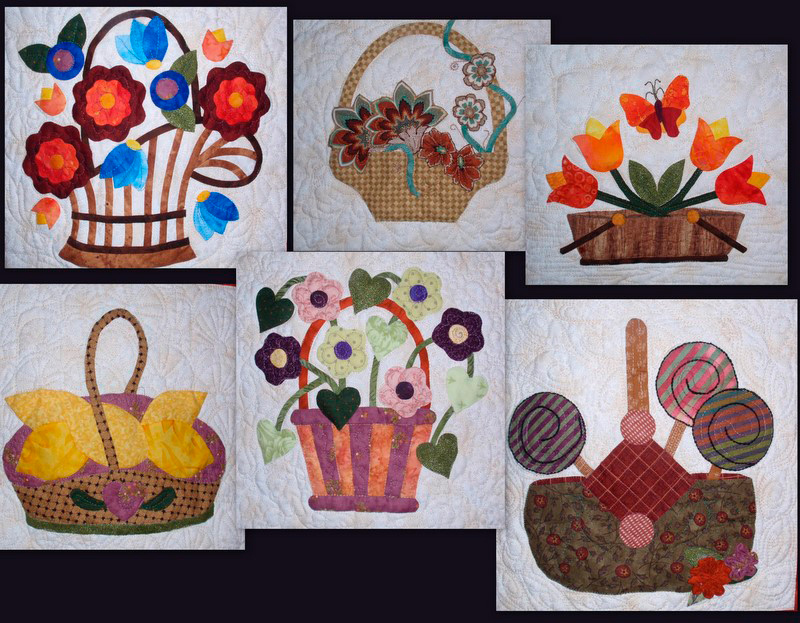 Sixteen women volunteered to make blocks, one person did the piecing, another the quilting and another the binding. 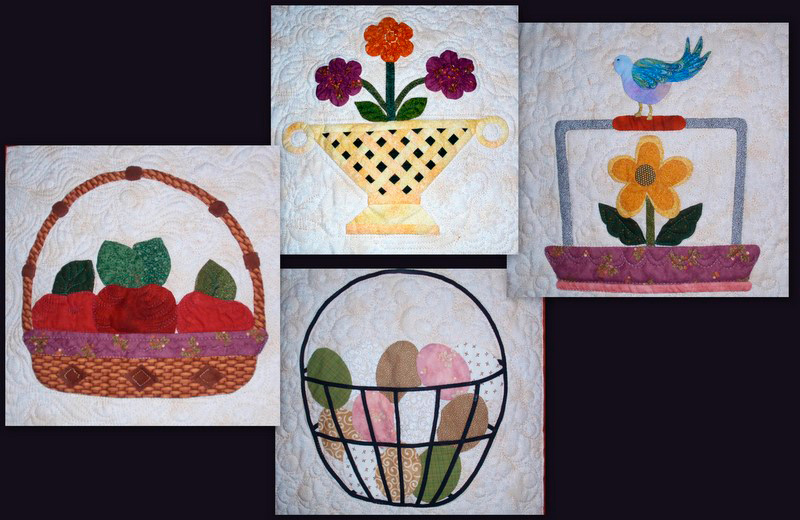 We used your 16 patterns from Baskets to Appliqué, and I designed four more to make a total of 20 blocks. My friend Shari Gillis and I designed the sashing for setting the 12″ blocks. 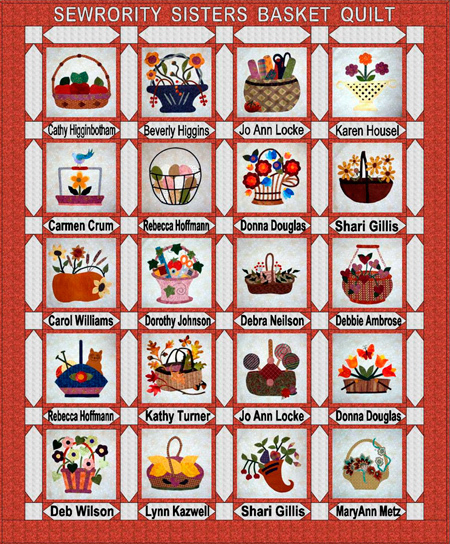 Some of the women added their own designs to the baskets and one person changed it completely. 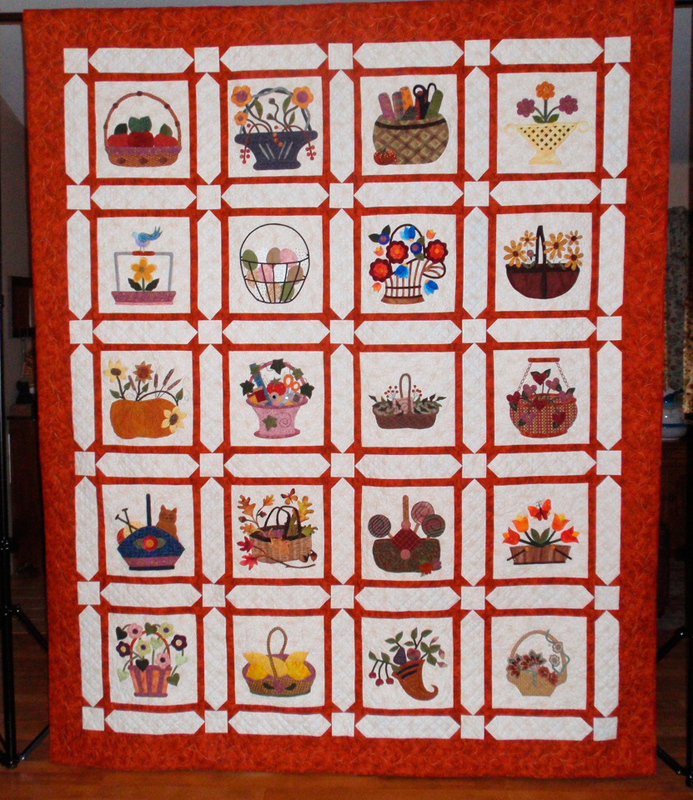 The quilt is finished, and we are now in the process of selling the raffle tickets. This is a beautiful quilt, I wish you could see it in person. Thank you so much for allowing us to use your patterns. We are hoping to make a large donation to the library. Oh my goodness, I should think so! 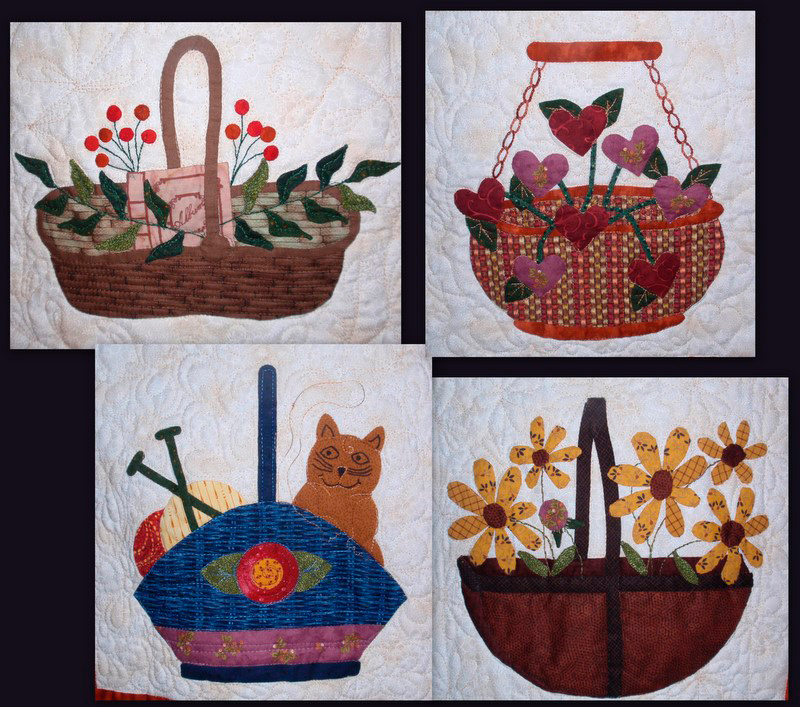 Huge thanks to you and your group, Rebecca, for choosing my basket designs for your quilt. I feel honored. You have elevated the designs and you’ve inspired me! Here are some closeups of the blocks. I’m so glad Rebecca sent me closeups so that I could see the delightful sewing doodads that were added to these blocks. How fun! My hat’s off! Here are the four blocks that Rebecca designed herself. As I told her, they’re so lovely and entirely to my taste. Do we see a new pattern designer emerging here? Here are two labels for the quilt that Rebecca did up in EQ7. Great job with the computer work!! 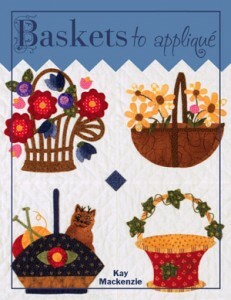 Now a word of news about Baskets to Appliqué. Gentle quilters, it’s very nearly out of print. That’s right, there are now exactly 14 copies left in captivity. But never fear, the designs will still be available once these copies are gone. I’ll be offering all 16 designs in a different format, an unbound pattern pack in a baggie. 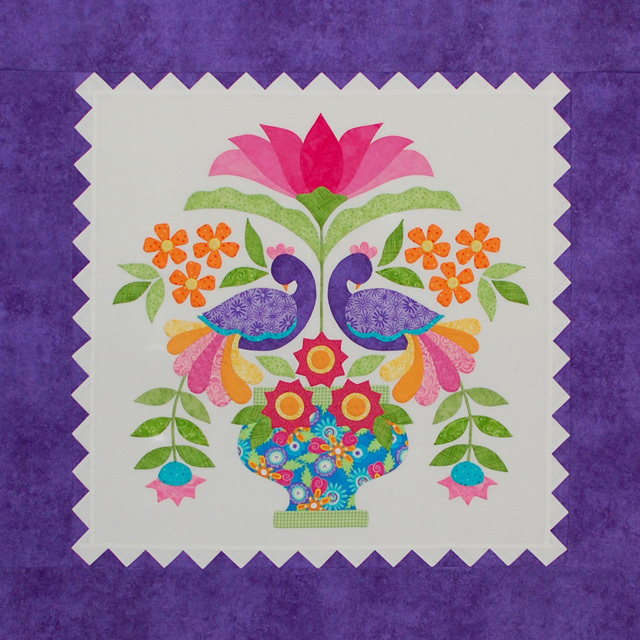 There won’t be any color photos or instructions, just the designs for your appliqué pleasure. The baskets will go on! The contest is now over. Bev Adcock is the lucky winner! 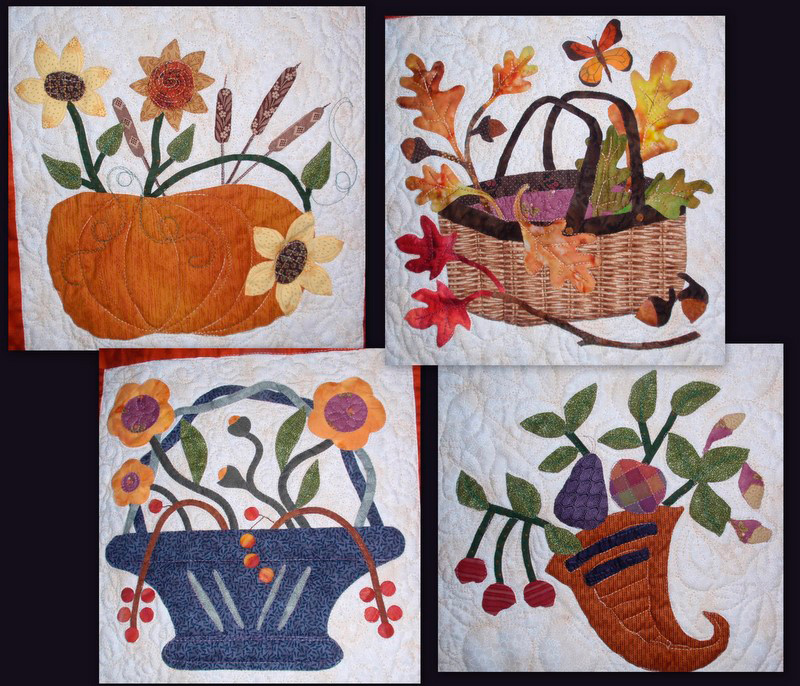 Today’s the day that the Fall Into Fall Quilt Bloggers Giveaway begins. Welcome blog hoppers! If you’re new to All About Appliqué, please take a couple minutes to look around. 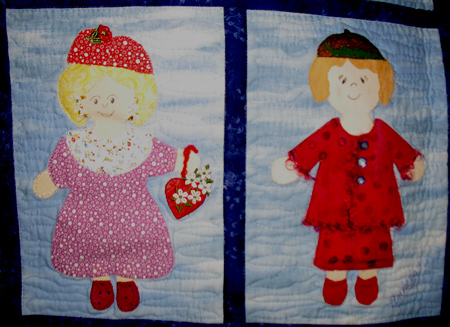 You’ll find lots of great information about appliqué here — any kind! Check out all the categories in the left-hand sidebar and the appliqué designers and pattern companies in the right-hand sidebar. Explore to your heart’s content! in 5 Sizes from That Patchwork Place. This book is chock full of appliqué block designs, from fun, modern and whimsical to more traditional-looking. There’s a companion CD that you can stick into your computer and print out the patterns in five sizes from 6″ to 12″ right at home. What a convenience! Please leave a comment here on this blog post to become eligible to win my giveaway. U.S. and Canada only due to the cost of shipping. I’ll draw a winner on the morning of October 15. Those subscribed by email, don’t forget to click over to the blog itself to leave your comment. And, be sure to visit the Fall Into Fall blog for links to all the other participating blogs! There’s a boatload of prizes waiting!